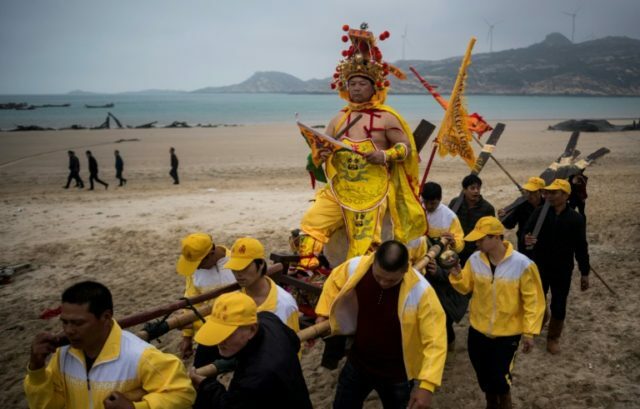 Nanri (China) (AFP) – “Possessed” by local gods, elaborately dressed villagers in a fishing community in eastern China are carried into the surf to ensure an abundant catch, a centuries-old rite needed now more than ever as fish stocks decline. Staged in the village of Fuye on Nanri island, “The Dash of the Ocean Gods” festival is one of many visually striking traditional rituals held in Fujian province in the weeks following the Lunar New Year, which this year fell on February 16. Dressed in embroidered apron-like garments and crowned with intricate headdresses, around 20 villagers chant and wave swords and banners as they are borne seaward on palanquins by their neighbours. They eventually end up in the surf where they splash about in a rite held on the 18th day of the new year to appeal for safe seas and full nets for Fuye, now home to about 5,000 people. Fishing remains a risky business for the villagers, most of whom can only afford small rickety boats, so they take to the seas carrying small statues or other images of local gods as protection. But Zhou Rongbin, a 28-year-old lifetime resident of Fuye, said gloom hung over the festival this year due to dwindling catches and rough seas. “Many people died last year (in fishing accidents) and I only made a little money. Our lives are so bad now,” he told AFP, saying most villagers know nothing but fishing. “These gods, we can ask them to keep us safe on the sea, but they can’t give us more fish or tell us where more fish are,” said Zhou, who is studying English in hopes of obtaining work on a large deep-sea fishing boat. Residents of the coastal fishing town of Huangqi about 150 kilometres (93 miles) to the north make their own appeals to the sea gods. For months, villager Lin Qianzun has spent his free time building the three-metre tall head of a Taoist sea deity who is worshipped for protecting fishermen in defiance of heavenly rules. The god was stripped of his divinity, decapitated and, according to local legend, his head fell from the heavens into the sea, where it was retrieved by the people of Huangqi. For hundreds of years, a giant head has been placed in a local temple where it is worshipped. It is paraded through town on the 16th day of the new year amid cheers and the pop of firecrackers. The following day, it is stuffed with paper “ghost money” for the afterlife and set ablaze to send it back to heaven. “We have a beautiful legend and in my eyes, the god’s head is so realistic, when I look at him, it comes alive,” said Lin.